The Midwest might have a reputation for being polite, but these homes are unapologetically modern. 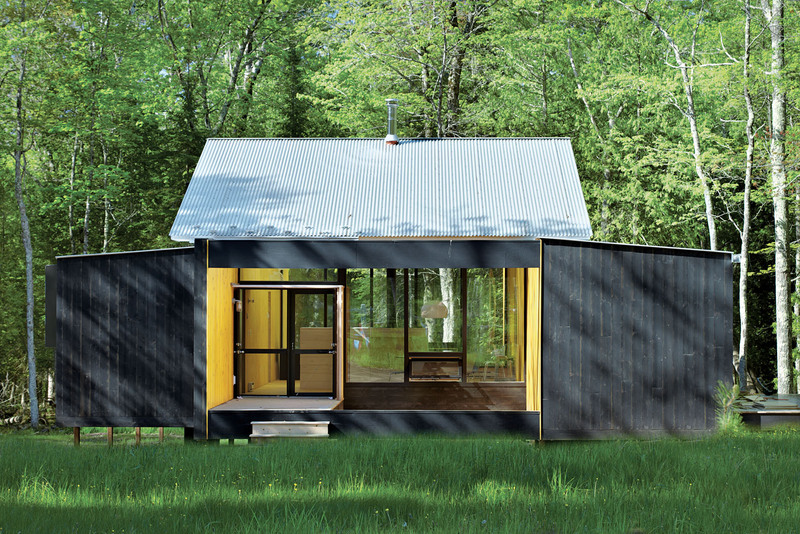 Architect Charlie Lazor opted for a wash of black on the prefab cabin he designed on Madeline Island, Wisconsin. Once ashamed of his lackluster Chicago abode, architect Brad Lynch tore it down and started over with a family home that’s part retreat and part public stage. The residence is set back a few feet from the site’s edge, allowing more light to flood into neighbors’ windows and leaving space for trees. At first glance, the Field House, a long rectangular box clad in shiny Galvalume Plus, and which Burnette designed in 2005 for Dr. Robert Geller, seems to owe its biggest debt to the region’s agricultural aesthetics. But look closer at how the house is positioned—flanked to the northwest by a line of trees, its leeward face looking out toward a meadow, a bird sanctuary, and a new fruit orchard. Geoff and Joanna Mouming’s compact modern farmhouse is the first permanent structure at Yum Yum Farm in Wellman, Iowa. On the field that stretches out before it, organic vegetables will soon make attentive farmers of the Moumings. The benches on their entry porch were built by Geoff using a design plan by Aldo Leopold, the pioneering Iowa-born conservationist and writer whose spirit and thoughts seem to preside over the house. Architect Dan Rockhill tackled a tight budget and a steep slope to build a modern Midwest haven. But, his biggest flourish was a slatted exterior screen of Cumaru wood that shields the inexpensive metal siding. In northwest Michigan, a vacation retreat boasts a prime vantage point from which to soak up the bucolic scenery. To enter the 1,400-square-foot house, the family first ascends an outdoor staircase. Next, they circulate through a windowed stairwell that allows them to see the canopy, past the floors containing the two bedrooms, eventually arriving at the main living space, which features floor-to-ceiling glass walls and a cantilevered deck.